Get a professional water leak detection device installation by Clovis Plumbing Services! Offer applies to the purchase and installation of a leak detection device. As the saying goes, water is the new gold. And with potable water supplies dwindling across the world, but especially in drought-stricken regions like our very own California, we get excited about any and all new water-saving technologies, such as water leak detection devices. It's with this spirit that we announce that we now supply and install the new Phyn Plus water leak detection device. 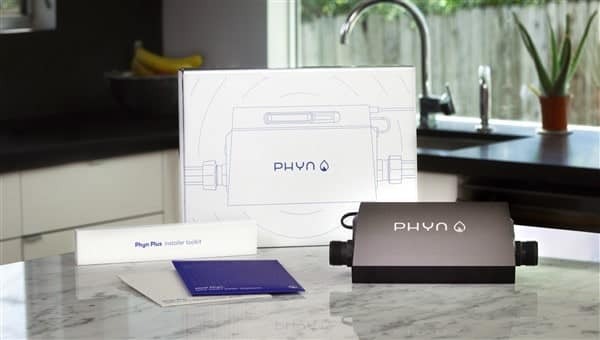 Phyn Plus is a neat device that connects to your home on the main water line. Using high-definition pressure wave sensing, the Phyn Plus is able to detect the tiniest of leaks. This is a patented technology, which combines Belkin's Wemo and Linksys platforms and advanced machine learning, with ultrasonic pressure sensing. The result? A superb water-sensing system integrated with intelligent features. What makes Phyn Plus so smart? Measuring micro changes in water pressure at a rate of 240 measurements per second, which is just mind-blowing, the Phyn Plus uses this data to actually learn the unique way in which your home and its residents use water on a daily basis. Using algorithms to analyze this data, as well as the data from pressure, flow and temperature settings, the Phyn Plus is able to identify plumbing issues in a heartbeat, ranging from basic leaks to dripping faucets and frozen pipes. The Phyn Plus system literally gets smarter over time. As it analyzes and stores data about your home's water usage, it unlocks new capabilities and offers you insights, helping you better understand and manage your water. Using WiFi to connect with your smartphone or smart device, Phyn Plus sends real-time notifications to alert you of potential leaks and give you the option of switching your main water supply off remotely, using the streamlined and user-friendly Phyn app. Possibly its most valuable feature, the Phyn is able to switch off a home's main water supply automatically should it detect a catastrophic water leak, such as a burst pipe. This saves you not only water, but drastically minimizes potential damage within the home. Phyn Plus uses the data that it's collected to run daily diagnostic plumbing checks, and alert you of any irregularities that may require the attention of a plumber in the near or distant future. This gives you the opportunity to implement the ideal scenario of “prevention is better than cure”. Other than water leak detection, the Phyn Plus offers valuable reporting on the usage of water in your home, offering you insights on how to save this precious commodity. Putting safety first, Phyn was designed in partnership with leading Finnish residential plumbing supplier, Uponor. The device is manufacture by global company Badge Meters, who have been innovative leaders within the industry for over 110 years. Phyn Plus is NSF certified. It can be installed indoors or outdoors, and withstands the elements like a champion. The water leak detection device is priced at $850 per unit, and one unit services one entire home. To ensure that Phyn Plus is fully functional and that all features are properly enabled, it needs to be installed by a licensed professional plumber. "We have been monitoring the development of Phyn Plus from its early stages and look forward to featuring it here in the Central Valley," says Tod Dale, Owner of Clovis Plumbing Services. "We're delighted to be official suppliers of this incredible water leak detection product, and in partnership with Phyn Plus and home owners around the world, we can't wait to start saving water, one drop at a time". Call us and discover why we are the go-to plumbing company in Clovis Ca.